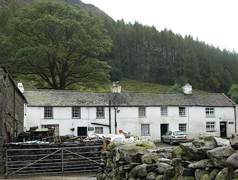 Chapel House Farm is the only owner-occupied farm in The Borrowdale Valley, and has been run by the same family (The Weirs) for three generations. The campsite itself is over 40 years old, and together with the farm is a greenfield site in the heart of the valley. The Campsite is located at the foot of Bessyboot, Ideally located for the Coast to Coast pathway and the Cumbrian Way. Chapel house farm campsite is set in the midst of the idyllic and tranquil Borrowdale valley. The atmosphere on site reflects this it is not a place for revelry, but rather a place to kick back and relax. For this reason we would deter anybody who is not winding down by 10 at night and quiet by 10.30 we also ask that early risers respect other campers. In keeping with the traditional style of camping, we do not offer electrical hook-up points. 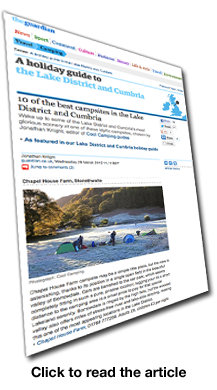 Chapel House Farm Camp Site was rated in the top ten campsites in Cumbria by The Guardian's Holiday Guide to The Lake District and Cumbria. "Chapel House Farm campsite may be a simple little place, but the view is astonishing, thanks to its position in a single open field in the beautiful valley of Borrowdale. Cars are banished to the car park, which seems completely fitting in such a pure, pristine location; lugging your kit a short distance to the camping area is a small price to pay for that special Lakeland serenity. Borrowdale is ringed by the high fells, but the wooded valley also offers miles of stress-free river and lake-side strolling, making this one of the most appealing locations in the Lake District." Regular hourly bus service all year to Keswick and Seatoller. In summer there are additional services every half hour, including a bus to Buttermere. There are dozens of good eating places in Keswick, but there are two within easy walking distance that will cater for most tastes. The Langstrath Country Inn (Stonethwaite) and The Scafell Hotel (Rosthwaite) both have a restaurant menu and excellent bar food. The bus (or boots even) allows easy access to Keswick (15-minute bus journey), where all sorts of activities await. Chapel House Farm Campsite is located approximately 6 miles South of the town of Keswick in Cumbria, on the B5289. You pay per person, per night stayed. Please view our current prices here. 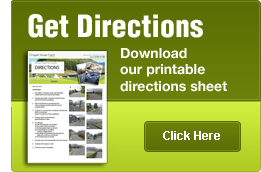 There are no additional charges for motorhomes, caravans, extra cars, pets etc. The only charges we make are for the number of people staying. Do You Have Electrical Hook Ups? We do not offer electrical hook-ups of any type. We do accept caravans, though you MUST book ahead as there are certain times it may not be possible to get you on site. Can I Bring My Dog (or other pets)? Yes, within reason! We welcome dogs and other small pets as long as they are not too numerous and kept under control! We only ask that you use common sense and respect our other guests. (There are no extra charges for pets). Because of the danger of fires in the forest, open fires are not allowed. Barbecues may be lit provided they are raised off the ground and are in a suitable container. If you do use a barbecue, please make sure that the smoke and fumes don't annoy the other guests. We welcome family, walking and D of E groups, though we ask larger groups (more than 8) to contact us in advance so we can be sure that you can be accomodated. We are in a quiet location and expect groups to be respectful to other campers. No loud noise is permitted after 10:30pm. We cater for D of E groups at £5 per head concession. In inclement weather there is a barn which many groups appreciate the use of (Lights, tables and chairs only). 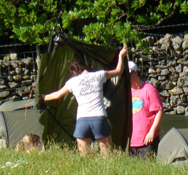 It is at the discretion of the Tutor if D of E groups are able to use the barn, just ask! Groups (other than Bronze D of E groups) can turn up 'on spec' or book in advance and receipts are available on request. We prefer Bronze D of E groups to book ahead, and they must be supervised by a responsible adult at all times.